In summer, reaching the summit of Tongariro is a steady – but certainly great – walk, a short detour off the popular Tongariro Crossing between the Mangatepopo valley and Ketetahi. Even so, parties setting out on the Crossing should be prepared for sudden changes in weather and mountain conditions. Winter on Tongariro is very different. Although on a ﬁne day a steady stream of visitors may still climb to the craters, there will be nothing like the constant ﬂow encountered in summer. Under snow, the broad expanses of the craters are a unique alpine environment. It’s a great day out. To reach the summit you will need an ice axe, crampons, and the ability to use them. 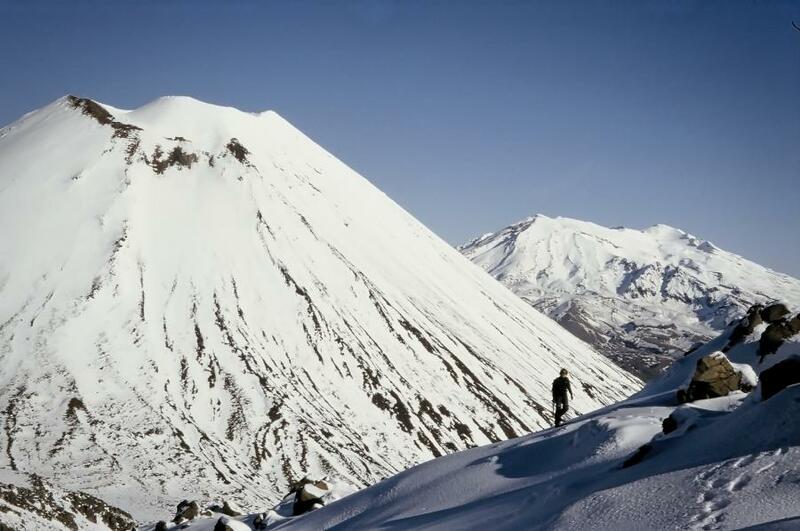 Tongariro is most often climbed as a short detour from the Tongariro Crossing. Starting from the Mangatepopo road end is quicker. From the high point of the Crossing, at the head of Red Crater, turn west and up the broad eastern spur to the summit proper. A more alpine excursion, the South Ridge begins at the head of Mangatepopo Valley at the entrance to South Crater. Scramble along over blocky ground to the summit. It is also possible to gain the upper South Ridge and summit by climbing directly out of the head of South Crater; neither conditions, views nor sunshine are likely to be as agreeable as on the ridge. From the summit, either descend to rejoin the Crossing, or avoid the crowds altogether and descend a scree slope down the mountain’s western flank towards the long ridge that hems the Mangatepopo valley on its northern side. A faint track leads back to the car park.